Name Variation Ph. Heinrich Friedrich Wilhelm Christoph Herman Klemme was also known as Herman. Ph. Heinrich Friedrich Wilhelm Christoph Herman Klemme was born on 25 May 1862 at Illinois. Ph. Heinrich Friedrich Wilhelm Christoph Herman Klemme died on 2 February 1889 at Kankakee, Illinois, at age 26. [S193] Church Record, Zion United Lake Co IN Extract, Baptism pg 74. no 8. [S186] Illinois, Illinois Statewide Marriage Index, license 10728. [S246] U.S. Federal Census 1880 U.S. Federal Census, by Ancestry.com, Stamp 24. Page 7. ED 190. Dwelling 205. Name Variation Wilhelmine Emilie Ema Klemme was also known as Emma Wilhelmine. Married Name 18 December 1898 As of 18 December 1898,her married name was Heldt. Wilhelmine Emilie Ema Klemme was born on 11 May 1877 at Illinois. Wilhelmine Emilie Ema Klemme was buried in 1950 at Saint John United Church of Christ Cemetery, Beecher, Will, Illinois. 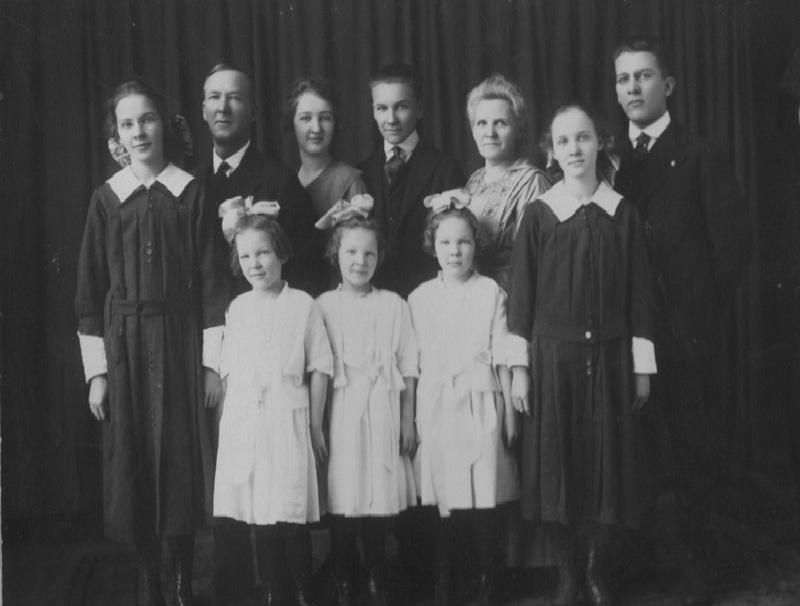 Wilhelmine Emilie Ema Klemme had 1 with 1 living in June 1900 children. Before 1901 portrait of Henry and Katherine (Grages) Klemme family. In Katharina Grages's will dated 7 November 1903 at Will, Illinois, Wilhelmine Emilie Ema Klemme was named as an heir. She had 1 with 1 living in 1910 children. [S193] Church Record, Zion United Lake Co IN Extract, Baptism pg 440. no 54. [S186] Illinois, Illinois Statewide Marriage Index, license 00018316. [S245] U.S. Federal Census 1900 U.S. Federal Census, by Ancestry.com, Year: 1900; Census Place: Washington, Will, Illinois; Roll: T623_ 354; Page: 8B; Enumeration District: 147. [S244] U.S. Federal Census 1910 U.S. Federal Census, by Ancestry.com, Year: 1910; Census Place: Yellowhead, Kankakee, Illinois; Roll: T624_298; Page: 9A; Enumeration District: 122; Image: 930. [S243] U.S. Federal Census 1920 U.S. Federal Census, by Ancestry.com, ED137. Dwelling 130. [S250] U.S. Federal Census 1930 U.S. Federal Census, by Ancestry.com, ED46-50. Dwelling 43. Anna Christina Sophia Ottilia Klemme was born on 1 September 1872 at Illinois. She was the daughter of Carl Frederick Klemme and Dorothea Moeller. Anna Christina Sophia Ottilia Klemme died before 1958. [S193] Church Record, Zion United Lake Co IN Extract, Baptism pg 350. no 42. Name Variation Mathilda Klemme was also known as Matilda. Married Name 17 November 1898 As of 17 November 1898,her married name was Heising. Mathilda Klemme was born on 18 August 1872 at Eagle Lake, Illinois. 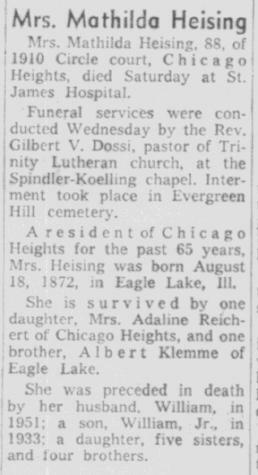 Mathilda Klemme died on 5 January 1961 at Chicago Heights, Cook, Illinois, at age 88 Mathilda (Klemme) Heising obituary. She was buried after 5 January 1961 at Evergreen Hill Memory Gardens (aka Evergreen Hill Cemetery), Steger, Will, Illinois. Children of Mathilda Klemme and William Heising Sr.
[S186] Illinois, Illinois Statewide Marriage Index, license 00018274. [S243] U.S. Federal Census 1920 U.S. Federal Census, by Ancestry.com, ED10. Dwelling 131. [S250] U.S. Federal Census 1930 U.S. Federal Census, by Ancestry.com, ED16-2016. Dwelling 175. Bertha Klemme was born on 1 March 1874 at Illinois. Bertha Klemme died on 23 February 1928 at age 53. [S193] Church Record, Zion United Lake Co IN Extract, Baptism pg 376. no 45. Name Variation Caroline Klemme was also known as Lina. Name Variation Caroline Klemme was also known as Carrie. Name Variation Caroline Klemme was also known as Carry. Name Variation Caroline Klemme was also known as Karolina. Married Name 3 February 1894 As of 3 February 1894,her married name was Behlke. Caroline Klemme was born on 8 January 1871 at Eagle Lake, Will, Illinois. Caroline Klemme and Herman Behlke were divorced before 1941. She was buried on 22 February 1941 at Chicago Heights, Cook, Illinois. Caroline Klemme was confirmed in 1886 at Zion United Church of Christ, Hanover, Lake, Indiana.6 She had 3 with 2 living in 1910 children. In March 1923 Mrs Carrie Behlke of East Chicago spent Sunday at the Charles A. Klemme home. [S193] Church Record, Zion United Lake Co IN Extract, Baptism pg 316. no 38. [S186] Illinois, Illinois Statewide Marriage Index, license 00015671. [S244] U.S. Federal Census 1910 U.S. Federal Census, by Ancestry.com, Year: 1910; Census Place: Chicago Heights Ward 1, Cook, Illinois; Roll: T624_237; Page: 36A; Enumeration District: 0011; FHL microfilm: 1374250. [S250] U.S. Federal Census 1930 U.S. Federal Census, by Ancestry.com, ED16-2017. Dwelling 177. Louis Heinrich Frahm was born on 10 June 1902 at Illinois. He was the son of Jacob Heinrich Frahm and Clara Balgemann. He married Jeanne Anderson, daughter of (?) Anderson, on 24 February 1927. Louis Heinrich Frahm died on 4 July 1969 at age 67. Louis Heinrich Frahm and Jeanne Anderson lived in 1935 at Bellevue, Allegheny, Pennsylvania. [S192] St. John's Ev. Lutheran, St. John's Churchbook Extract, Baptism pg 124. no 14. Married Name 25 June 1924 As of 25 June 1924,her married name was Hanson. Hilda Louise Anna Frahm was born on 3 July 1905 at Illinois. She was the daughter of Jacob Heinrich Frahm and Clara Balgemann. She married Fred Hanson on 25 June 1924. [S192] St. John's Ev. Lutheran, St. John's Churchbook Extract, Baptism pg 132. no 20. Name Variation Orienf N. Eastman was also known as Orient. Name Variation Orienf N. Eastman was also known as O. N.
Orienf N. Eastman was born circa 1861 at Minnesota. He was the son of Daniel T. Eastman and Hannah J. Fowler. Orienf N. Eastman married Catherine L. Croal, daughter of Andrew James Croal and Honora Brigid Gormanly, circa 1887. Orienf N. Eastman died before 1901. 1 June 1865 Territorial and State Census, Merton, Steele, Minnesota Orienf N. Eastman appeared on the census of 1 June 1865 in the household of Daniel T. Eastman at Territorial and State Census, Merton, Steele, Minnesota; household also includes Addison Eastman. 1 May 1885 Minnesota Territorial and State, Medford, Steele, Minnesota Orienf N. Eastman appeared on the census of 1 May 1885 in the household of Daniel T. Eastman at Minnesota Territorial and State, Medford, Steele, Minnesota. Orienf N. Eastman was a traveling auditor for the Empire Elevator Company at Seattle, Washington. He was a bookkeeper at Pratt & Porter; wife and son not listed in this directory in 1888 at Minneapolis, Minnesota. [S247] U.S. Federal Census 1870 U.S. Federal Census, by Ancestry.com, Page 6. Dwelling 49. [S246] U.S. Federal Census 1880 U.S. Federal Census, by Ancestry.com, NA Film Number T9-0635 Page Number 42C. Dewlling 109. Name Variation James Matthew Croal was also known as James H.
James Matthew Croal was born on 2 February 1862 at Wisconsin also reported as Feb 1863. He was the son of Andrew James Croal and Honora Brigid Gormanly. James Matthew Croal married Jennie E. Barrett, daughter of Thomas P. Barrett and Annie (? ), circa 1892. James Matthew Croal died on 19 December 1943 at age 81. He was buried after 19 December 1943 at Funeral, Fargo, Cass, North Dakota. [S246] U.S. Federal Census 1880 U.S. Federal Census, by Ancestry.com, NA Film Number T9-1438. Page 117D. ED131. Dwelling 326. Name Variation Mary Agnes Croal was also known as Mary Anne. Married Name circa 1890 As of circa 1890,her married name was Kaercher. Mary Agnes Croal was born in August 1865 at Wisconsin. She was the daughter of Andrew James Croal and Honora Brigid Gormanly. Mary Agnes Croal married Leonard Michael Kaercher, son of John Michael Kaercher and Barbara Kraemer, circa 1890. She was buried after 17 June 1923 at Saint Lawrence Cemetery, Milbank, Grant, South Dakota. Mary Agnes Croal was a teacher in 1888. 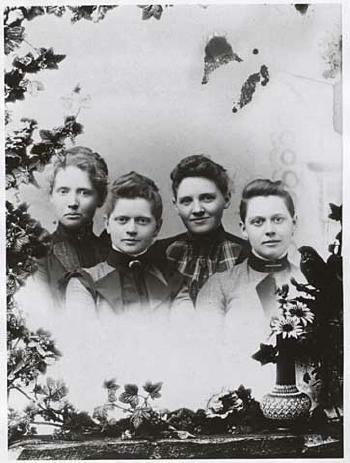 Circa 1890 Mary Anne Croal (later Mrs. L. M. Kaercher), second from right, with her sisters. [S362] South Dakota, South Dakota Death Index, 1905-1955, Certificate Number: 87419. [S245] U.S. Federal Census 1900 U.S. Federal Census, by Ancestry.com, ED155. Sheet 7B. Dwelling 137. Ward 1. [S243] U.S. Federal Census 1920 U.S. Federal Census, by Ancestry.com, ED160. Dwelling 180. Ward 3. Name Variation Leonard Michael Kaercher was also known as Kaucher. Name Variation Leonard Michael Kaercher was also known as L. M.
Leonard Michael Kaercher was born in June 1862 at Minnesota. He was the son of John Michael Kaercher and Barbara Kraemer. Leonard Michael Kaercher married Mary Agnes Croal, daughter of Andrew James Croal and Honora Brigid Gormanly, circa 1890. Leonard Michael Kaercher died on 15 May 1944 at Milbank, Grant, South Dakota, at age 81. He was buried after 15 May 1944 at Saint Lawrence Cemetery, Milbank, Grant, South Dakota. [S247] U.S. Federal Census 1870 U.S. Federal Census, by Ancestry.com, Roll: M593_3 Page: 181 Image: 644. Dwelling 148. [S246] U.S. Federal Census 1880 U.S. Federal Census, by Ancestry.com, NA Film Number T9-0619. Sheet 282C. [S250] U.S. Federal Census 1930 U.S. Federal Census, by Ancestry.com, ED6-8. Dwelling 11. Married Name circa 1894 As of circa 1894,her married name was Wilson. Theresa Genevieve Croal was born on 15 October 1867 at Wisconsin. Theresa Genevieve Croal married William Weagan Wilson, son of (?) Wilson and unknown (? ), circa 1894. Theresa Genevieve Croal died on 25 January 1955 at age 87. [S245] U.S. Federal Census 1900 U.S. Federal Census, by Ancestry.com, ED155. Dwelling 58. [S244] U.S. Federal Census 1910 U.S. Federal Census, by Ancestry.com, ED198. Dwelling 166. [S243] U.S. Federal Census 1920 U.S. Federal Census, by Ancestry.com, ED159. Dwelling 90. Stamp 259. [S250] U.S. Federal Census 1930 U.S. Federal Census, by Ancestry.com, ED26-17. Dwelling 339-349. Name Variation William Weagan Wilson was also known as W. W.
William Weagan Wilson was born in February 1865 at Minnesota. He was the son of (?) Wilson and unknown (?). William Weagan Wilson married Theresa Genevieve Croal, daughter of Andrew James Croal and Honora Brigid Gormanly, circa 1894. William Weagan Wilson died after April 1930. Name Variation Francis Andrew Croal was also known as France. Name Variation Francis Andrew Croal was also known as F. A. Name Variation Francis Andrew Croal was also known as Andrew. Francis Andrew Croal was born on 7 August 1869 at Milwaukee, Milwaukee, Wisconsin. Francis Andrew Croal married Elizabeth Gertrude Lee, daughter of John Lee and Katherine J. Hogan, after June 1900. He was buried after 3 July 1941 at Saint Lawrence Cemetery, Millbank, Grant, South Dakota. [S329] Minnesota Death Index, 1908-2002 (published), State File Number: 020823. [S245] U.S. Federal Census 1900 U.S. Federal Census, by Ancestry.com, ED155. Dwelling 20. Sheet 1B. [S244] U.S. Federal Census 1910 U.S. Federal Census, by Ancestry.com, ED198. Dwelling 203. [S243] U.S. Federal Census 1920 U.S. Federal Census, by Ancestry.com, ED159. Dwelling 163. Stamp 262. Name Variation Anna Croal was also known as Honora Brigid. Name Variation Anna Croal was also known as Annie. Married Name 3 June 1902 As of 3 June 1902,her married name was Hicks. Anna Croal was born on 25 January 1871 at Milwaukee, Wisconsin. Anna Croal married Dr. Thomas H. Hicks, son of John Hicks and Letitia Cunningham, on 3 June 1902. Anna Croal died on 16 December 1950 at Milbank, Grant, South Dakota, at age 79. She was buried after 16 December 1950 at Saint Lawrence Cemetery, Milbank, Grant, South Dakota. [S244] U.S. Federal Census 1910 U.S. Federal Census, by Ancestry.com, ED198. Dwelling 77. [S243] U.S. Federal Census 1920 U.S. Federal Census, by Ancestry.com, ED158. Dwelling 130. [S250] U.S. Federal Census 1930 U.S. Federal Census, by Ancestry.com, ED26-16. Dwelling 6. Name Variation Dr. Thomas H. Hicks was also known as H. T.
Dr. Thomas H. Hicks was born on 10 August 1864 at Ontario, Canada. He was the son of John Hicks and Letitia Cunningham. Dr. Thomas H. Hicks married Anna Croal, daughter of Andrew James Croal and Honora Brigid Gormanly, on 3 June 1902. Dr. Thomas H. Hicks died on 14 December 1935 at Roberts, South Dakota, at age 71. He was buried after 14 December 1935 at Saint Lawrence Cemetery, Milbank, Grant, South Dakota. Dr. Thomas H. Hicks was a veterinarian; State Veterinarian from 1904 to 1913. He immigrated in 1882. He lived in 1883 at Andover, Day, South Dakota, made homestead. He was a state veterinary surgeon in 1909 at Milbank, Grant, South Dakota. [S245] U.S. Federal Census 1900 U.S. Federal Census, by Ancestry.com, ED149. Dwelling 135. Nickname Thomas Bernard Croal also went by the name of Tom. Thomas Bernard Croal was born in March 1875 at Wisconsin tombstone reported birth as 1873. Thomas Bernard Croal married Mamie Lacross, daughter of Louis A. Lacross and Nannie Reid B. (? ), circa 1908. Thomas Bernard Croal was buried in 1963 at Woodlawn Cemetery, Las Vegas, Nevada, CROAL, Thomas B. "Popper." [S243] U.S. Federal Census 1920 U.S. Federal Census, by Ancestry.com, ED3. Sheet 16B. Dwelling 460. [S250] U.S. Federal Census 1930 U.S. Federal Census, by Ancestry.com, ED2-7. Dwelling 136. Married Name 1888 As of 1888,her married name was Croal. 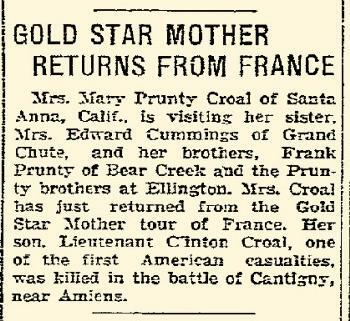 She was the daughter of Patrick Henry Prunty and Anna Nancy Hafner. Mary Jane Prunty married John Patrick Croal, son of Andrew James Croal and Honora Brigid Gormanly, in 1888 at Day, South Dakota. She was buried after 29 October 1946 at Holy Sepulcher Cemetery, Orange, Orange, California. Mary Jane Prunty migrated in 1918 at San Francisco, California, "Vincent took his Mother to California and worked at every odd job to make ends meet while attending the School of Physicians and Surgeons in San Francisco." According to Father Tom Croal, 4/2002. In July 1931 Mary Prunty Croal is visiting her sister Mrs Edward (Anna) Cummings, after returning from France and visiting her son's grave. In August 1931 Mrs. Mary Croal, Los Angeles, is visiting at the home of her brother, James Prunty. 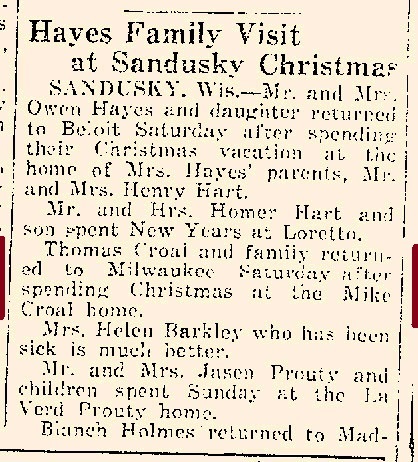 Appleton Post Crescent August 25, 1931 - Mrs. Mary Croal, Los Angeles, is visiting at the home of her brother, James Prunty. [S245] U.S. Federal Census 1900 U.S. Federal Census, by Ancestry.com, ED 289. Stamp 99A. Sheet 7. Dwelling 136. [S244] U.S. Federal Census 1910 U.S. Federal Census, by Ancestry.com, ED 373. Sheet 12A. Dwelling 204. Stamp 181. [S250] U.S. Federal Census 1930 U.S. Federal Census, by Ancestry.com, ED30-78. Dwelling 532. Name Variation Patrick Henry Prunty was also known as P. H.
Patrick Henry Prunty was born in March 1825 at Drumbenish, Leitrim, Province Connaught, Ireland, also reported as 17 March 1826. He was the son of Felix Laughlin Prunty and Abagail Kallahan. Patrick Henry Prunty married Anna Nancy Hafner, daughter of John Hafner and Nora Dwyer, on 15 July 1857 at Outagamie, Wisconsin. Patrick Henry Prunty died after June 1900. 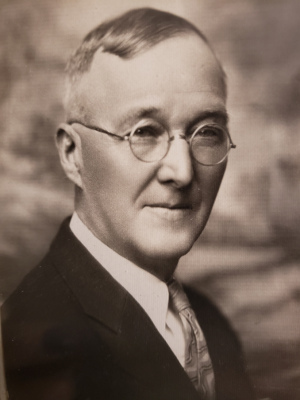 PATRICK H. PRUNTY, a well-known citizen of Outagamie county, was born in Province Connaught, Ireland, and came to the United States with his brother, Peter, in 1845, when nineteen years of age, settling near Boston, Massachusetts, where he secured employment on farms. In 1851 the brothers started for Californiia, via the Isthmus of Panama, making their way by foot across to the Pacific coast, where they took a vessel. After spending three years in placer mining they returned over the same route, and remained in Boston during the winter of 1855, when they came to Outagamie county, via Milwaukee. Patrick H. Prunty bought the south onehalf of section 15, Town 22, range 16 east, in Ellington township. His brother Peter also purchased a quarter section of land north of the town of Stephensville. Patrick H. Prunty sold the east onehalf of the southeast quarter of section 15 later on, and still later disposed of another eighty acres, but continued to hold 200 acres, which he developed from a wild waste of timber land on which only a small claim shanty had been built, into a fertile, productive farm with large residence, handsome barns and other farm buildings. On July 18, 1858, he was married to Anna Haffnier, who was born in County Tipperary, Ireland, and came to this country when three years of age in 1837, with her father and mother, John and Nora (Dwyer) Haffnier, who came. to this county in 1848 and settled in Greenville township, where both died. Mr. and Mrs. Prunty have been the parents of ten children, as follows: Peter S., who met an accidental death while operating a threshing machine in South Dakota, August 29, 1885, at the age of twenty-seven years; John H., who died in 1902, when forty-three years old; Patrick L., residing in Canada; Mary J., who married J. P. Crow and lives in South Dakota; Nora E., who married Frank Sheelar, of South Dakota; Michael E., unmarried and living on the homestead; Catherine, who is keeping house for her father in Appleton; Francis T., who married Agnes Corney and lives at Bear Creek; James, living on the homestead; and Anna E., teaching in the Third Ward school, Appleton, Wisconsin.5 Patrick Henry Prunty immigrated on 6 July 1845 to on "The Bombay", Boston, Massachussets, date landed in US. He migrated circa 1855 at Stephensville, Outagamie, Wisconsin. [S316] Thomas Henry Ryan, History of Outagamie County, Wisconsin. Name Variation Elizabeth Croal was also known as Bessie. Name Variation Elizabeth Croal was also known as Annie Elizabeth. 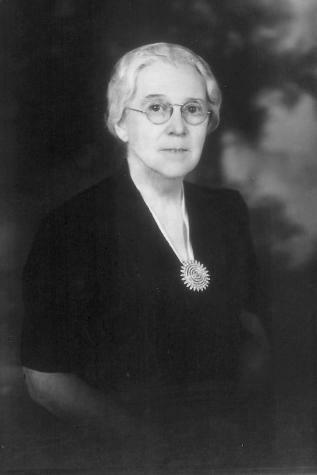 Elizabeth Croal was born in December 1888 at South Dakota. She was the daughter of John Patrick Croal and Mary Jane Prunty. 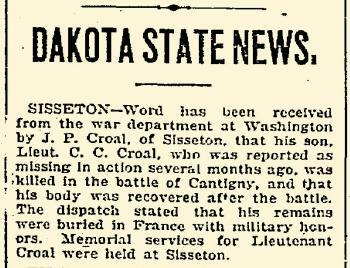 Elizabeth Croal was buried in January 1919 at Saint Lawrence Cemetery, Millbank, Grant, South Dakota, also reported as 1918. She died in January 1919 at from the flu, Missoula, Montana, at age 30 Bessie was teaching in Montana. Aberdeen Daily News Jan 23, 1919 - telegram received with news of her death; also reported as 1918. Name Variation Lt. Clinton Charles Croal was also known as Charles Clinton. Lt. Clinton Charles Croal was born on 22 August 1891 at Pierpont, South Dakota. He was the son of John Patrick Croal and Mary Jane Prunty. As of June 1917, Lt. Clinton Charles Croal was never married. 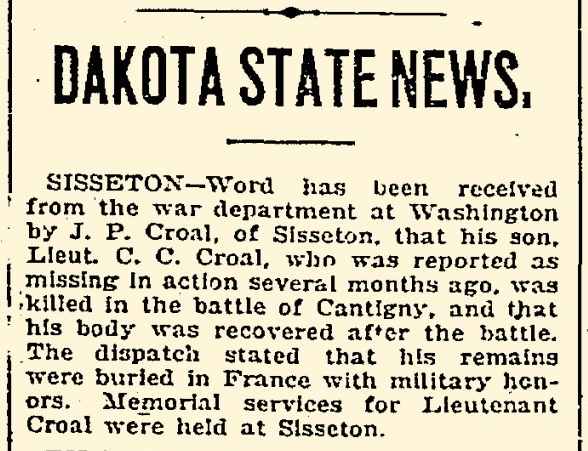 He was buried in 1918 at Saint Lawrence Cemetery, Millbank, Grant, South Dakota, In Memory of Lieut. C. C. Croal; Cantigney France. He died in 1918 at from German artillery while in service of his county, France, SD World War I Honor Roll - died while in their country's service during World War I, 1917 - 1918.
in 1913 at South Dakota Railroad Workers, Aberdeen, Brown, South Dakota. In 1915 Clinton graduated from the Sisseton high school and subsequently took a law course in the State University at Vermillion, from which he was graduated in 1911 with the degree of LL. B. He was admitted to the bar when only nineteen and a half years old and is now connected with Porter & Grantham, general solicitors for North and South Dakota for the Chicago, Milwaukee & St. Paul Railroad.3 On 5 June 1917 at World War I Draft Registration, Brown, South Dakota. Name Variation Dr. Vincent Cornelius Croal DDS was also known as V. C.
Name Variation Dr. Vincent Cornelius Croal DDS was also known as Doc. Dr. Vincent Cornelius Croal DDS married Mary Evelyn Banks on 23 July 1929 at St. Joseph's Church, Santa Ana, Orange, California. He migrated in 1918 at San Francisco, California, "Vincent took his Mother to California and worked at every odd job to make ends meet while attending the School of Physicians and Surgeons in San Francisco." According to Father Tom Croal, 4/2002. He graduated on 23 May 1924 at College of Physicians and Surgeons of San Francisco, San Francisco, San Francisco, California. He was a dentist in 1934. In February 1934 at Orange, California, Dr Vincent C Croal, DDS - advertisement. [S9] South Dakota, South Dakota Birth Records South Dakota, State File Number: 694235 (unknown file date). [S250] U.S. Federal Census 1930 U.S. Federal Census, by Ancestry.com, ED30-80. Dwelling 308. Joseph Croal was born circa 1865 at Wisconsin. Joseph Croal died after 1911. Joseph Croal lived at San Francisco, California. [S247] U.S. Federal Census 1870 U.S. Federal Census, by Ancestry.com, Page 6. Stamp 272. Dwelling 42. [S246] U.S. Federal Census 1880 U.S. Federal Census, by Ancestry.com, ED 264. Pg 1. Stamp 262A. Dwelling 9. 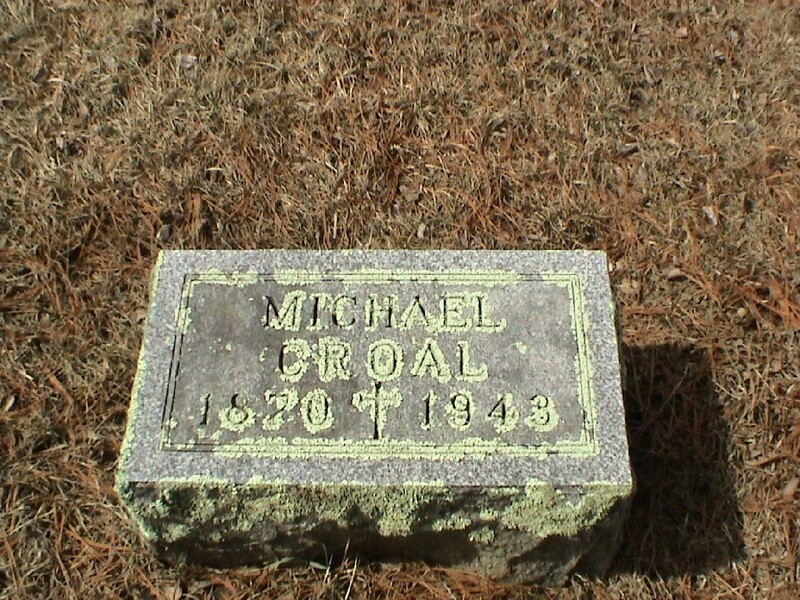 Name Variation Michael E. Croal was also known as M. E.
Nickname Michael E. Croal also went by the name of Mike. 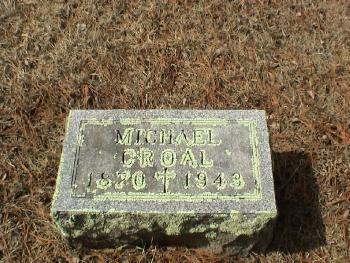 Michael E. Croal was born on 23 August 1871 at Wisconsin also reported as Aug 1872; tombstone lists birth as 1870. As of 1940, Michael E. Croal was never married. 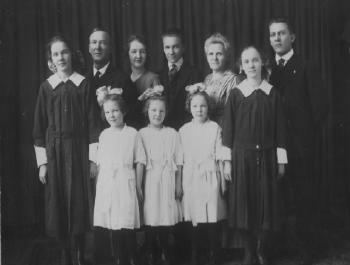 parents of eight children: John; Andrew, now deceased; Thomas; Joseph; Mary; Katherine; Jennie, now deceased; and Michael E. Michael E. Croal was born on his father's farm in Washington Township August 23, 1871. He has never married and his sisters Katherine and Mary keep house for him, while he gives his attention to a large and well managed farm and also to numerous public duties. The Croal farm consists of 200 acres, and Mr. Croal for a number of years has specialized in the breeding of Shorthorn cattle. He has served as town clerk for three years and is an active democrat. He is a trustee of St. Patrick's Catholic Church and is affiliated with the Modern Woodmen of America and the Knights of Columbus. In January 1923 at Sandusky, Sauk, Wisconsin, Thomas Croal and family returned to Milwaukee Saturday after spending Christmas at the Mike Croal home. [S245] U.S. Federal Census 1900 U.S. Federal Census, by Ancestry.com, ED148. Sheet 6A. Dwelling 109. [S243] U.S. Federal Census 1920 U.S. Federal Census, by Ancestry.com, ED212. Sheet 8A. Dwelling 159. [S250] U.S. Federal Census 1930 U.S. Federal Census, by Ancestry.com, ED56-38. Sheet 7B. 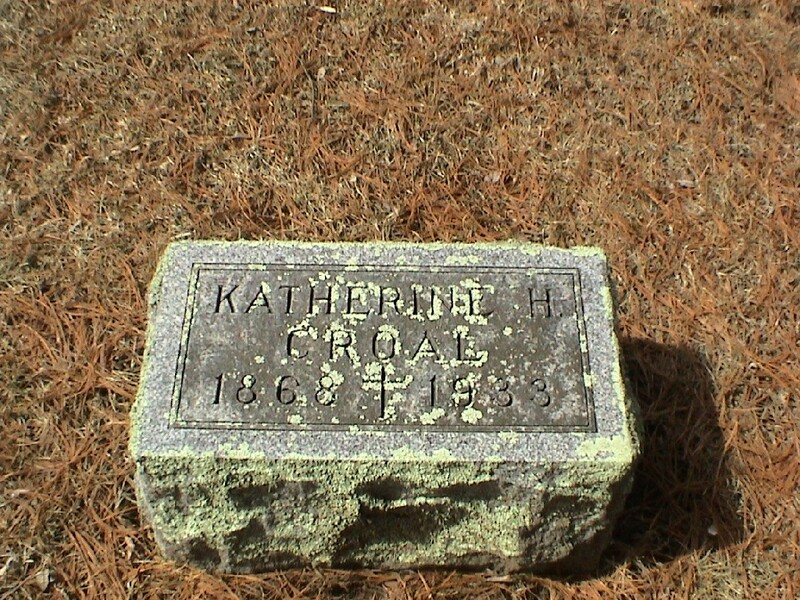 Name Variation Katherine H. Croal was also known as Kit. 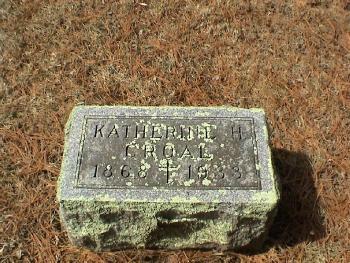 Name Variation Katherine H. Croal was also known as Catherine. Name Variation Katherine H. Croal was also known as Katherine F.
Katherine H. Croal was born in April 1870 at Wisconsin tombstone lists birth as 1868. She was the daughter of John Croal and Catherine Daly. As of 1930, Katherine H. Croal was never married. Katherine H. Croal lived in November 1925 at Milwaukee, Milwaukee, Wisconsin. She was a nurse at the county hospital in 1930. [S250] U.S. Federal Census 1930 U.S. Federal Census, by Ancestry.com, ED40-374. Dwelling 309. Name Variation Mary Ann Croal was also known as Eliza. Married Name circa 1850 As of circa 1850,her married name was McCabe. Mary Ann Croal was born in March 1828 at County Leitrim, Ireland, also reported as 17 Mar 1824/1826. Mary Ann Croal married John McCabe, son of Frank McCabe and Anna Kerin, circa 1850. 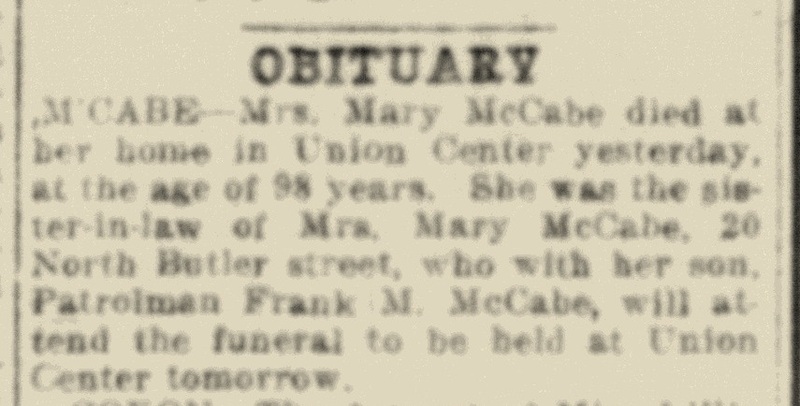 Mary Ann Croal died on 21 March 1912 at Union Center, Juneau, Wisconsin, Mary (Croal) McCabe obituary. 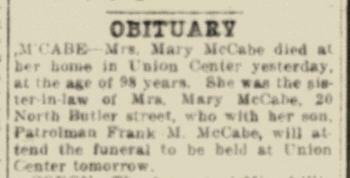 She was buried on 23 March 1912 at Saint Patrick Cemetery, Winfield, Sauk, Wisconsin. 1 June 1905 Wonewoc, Juneau, Wisconsin Mary Ann Croal appeared on the census of 1 June 1905 in the household of Frank Joseph Ganser at Wonewoc, Juneau, Wisconsin. Mary Ann Croal had 9 with 6 living in 1900 children. She had 9 with 5 living in 1910 children. [S249] U.S. Federal Census 1850 U.S. Federal Census, by Ancestry.com, Year: 1850; Census Place: Danbury, Fairfield, Connecticut; Roll: M432_37; Page: 133B; Image: 270. [S246] U.S. Federal Census 1880 U.S. Federal Census, by Ancestry.com, Year: 1860; Census Place: Whitewater, Walworth, Wisconsin; Roll: M653_1434; Page: 678; Family History Library Film: 805434. [S247] U.S. Federal Census 1870 U.S. Federal Census, by Ancestry.com, Year: 1870; Census Place: Winfield, Sauk, Wisconsin; Roll: M593_1739; Page: 309A; Image: 625; Family History Library Film: 553238. [S246] U.S. Federal Census 1880 U.S. Federal Census, by Ancestry.com, Year: 1880; Census Place: Winfield, Sauk, Wisconsin; Roll: 1446; Family History Film: 1255446; Page: 293D; Enumeration District: 266; . [S245] U.S. Federal Census 1900 U.S. Federal Census, by Ancestry.com, ED130. Dwelling 197. Year: 1900; Census Place: Winfield, Sauk, Wisconsin; Roll: T623_1816; Page: 11A; Enumeration District: 130. [S244] U.S. Federal Census 1910 U.S. Federal Census, by Ancestry.com, Year: 1910; Census Place: Wonewoc, Juneau, Wisconsin; Roll: T624_1714; Page: 13B; Enumeration District: 0085; FHL microfilm: 1375727. Jacob Krohn was born in April 1841 at Holstein, Prussia. He married Margretha Struck circa 1866. Jacob Krohn died on 9 May 1910 at age 69. Jacob Krohn immigrated in 1865. [S247] U.S. Federal Census 1870 U.S. Federal Census, by Ancestry.com, Stamp 162. Page 15. Dwelling 110. [S246] U.S. Federal Census 1880 U.S. Federal Census, by Ancestry.com, Stamp 271. Page 19. ED264. Dwelling 174. [S244] U.S. Federal Census 1910 U.S. Federal Census, by Ancestry.com, ED125. Dwelling 76. Name Variation Margretha Struck was also known as Martha. Name Variation Margretha Struck was also known as Margaret. Married Name circa 1866 As of circa 1866,her married name was Krohn. Margretha Struck was born in March 1843 at Hanover, Germany, also listed as March 1842. She married Jacob Krohn circa 1866. Margretha Struck died on 9 November 1911 at age 68. Margretha Struck immigrated in 1865. She had 9 with 9 living in 1900 children. She had 9 with 8 living in 1910 children. Name Variation Rosa Jane Croal was also known as Jennie. Rosa Jane Croal was born in May 1870 at Wisconsin. Rosa Jane Croal died in February 1874 at age 3 killed in rampage by her father, John Croal.